Simon the smug lawyer says Libby might fight the Chronicle but they'll always win! Darcy's waiting with a bunch of flowers. Tess pulls up in a nice new red beetle. She gets out and he asks her to listen to him but she doesn't want to. She does however take the flowers and card he came with, but then chucks them in the wheelie bin. Darcy isn't very happy – he'd probably have preferred to have kept the flowers for himself. Susan is outraged about Simon – what a smarmy, snake in the grass lawyer he is! She thinks he's making such a song and dance about the Chronicle's innocence because he knows fine well they're totally guilty. Maggie claps at this insight. What upsets Libby the most is the fact he's making her out to be greedy. Maggie firmly tells them that if he makes them doubt themselves then they've won. Susan says he won't be able to. Where Karl answers the door to Darcy. 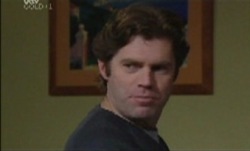 Darcy was looking for Susan who Karl informs him isn't there. Darcy decides to take the opportunity to say a few words about his relationships, even though Karl thinks it's none of his business. Darcy just wants to talk to someone about it all and he thought Karl of all people would understand. Karl protests that he doesn't care about it but they both know it isn't true so Darcy dives right in: he knows Karl doesn't want to continue working with him so he's willing to dissolve the partnership – they never have to speak to each other again. Darcy can't make a fairer offer than that. Oh the Hancocks (groans all round). Evan sorts through the mail. Emily is hungry. Mummy is saving the world. Leo is going to enter the chess finals. Matty is outside. So much for family togetherness. They devise some interesting toasted sandwiches to have for dinner and then Emily and Leo have a pillow fight. Maggie and Susan head off. Susan tells Libby to stay calm: she'll do the stressing! Once Susan's gone Drew says they have nothing to worry about – Libby's in the right. SUSAN: What, feminism's all well and good until it gets in the way of the male point of view which is that women should be having babies?! She thinks he's being sexist: he thinks he's being a doctor. Libby needs to rest and think of the baby. Susan takes this as being a dig at her – not knowing what her own daughter needs after having three kids of her own! He's just so stubborn and that's why he and Darcy haven't made up. This leads Karl to tell Susan about Darcy's offer which he's considering carefully as he ‘doesn't jump feet first' into everything like she does. 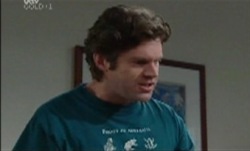 Susan argues that Darcy's trying to do the right thing by dissolving the partnership: Karl thinks he might be bluffing. Then it comes back to Karl making judgements – he can't when he made the same mistake as Darcy did. KARL: We're back to that, are we? SUSAN: Well, I'm sorry, but you can't rewrite history, can you? On that note Susan decides to go out and Karl heaves a big sigh. Susan's chatting with Darcy. Darcy expects people to have opinions about what he's done. Susan admits she doesn't understand it. He says the only thing he's guilty of is trying not to hurt anyone. He adored and maybe even loved Dee. Susan thinks the part of it that people have a problem with is Tess' vulnerability. Darcy knew he was drawn to Tess but he wanted to wait and work out his feelings. Susan points out that he wasn't in such a good position himself, having just broken up with Alice. She says that tearing up the contract with Karl isn't going to prove anything. Darcy thinks it does: it won't work with one unwilling partner. Susan isn't sure whether Karl will break the contract or not. Now she's feeling guilty over the bust up they had earlier. Susan wonders about Tess but Darcy says she won't speak to him. SUSAN: She must be so hurt. In bed Libby and Drew discuss the case. Drew just hopes she won't get all stressed about it. It would be easier if it were a simple case of right and wrong but, as Drew points out, the Chronicle will make it seem like it isn't. He will back her all the way but he'll still worry about her – about both of them. Susan comes in and Karl's not very responsive, seemingly engrossed in his paperwork. He says no to dessert so Susan decides to bring up the cold attitude. Karl says what she said earlier was very unfair. She apologises and tells him she was at the pub with Darcy who thinks the whole world is against him. Karl thinks it's such a mess but Susan says it doesn't need to be – Darcy so wants to go into partnership with Karl. He wouldn't bluff with something so important. Karl doesn't know why he isn't comfortable with it but he isn't. SUSAN: Because you're a grumpy old man who has to get his own way about everything. She thinks he's threatened and he admits it's partly true. They know each other too well. Karl promises to talk to him and will offer the partnership if he wants it. Susan thinks he's doing the right thing. The next day Darcy walks over the Karl, who's driving past the house. They agree to the partnership and Darcy even gets a lift to work! Libby and Drew pull up and Karl goes to talk to them. Libby didn't sleep well, something Karl was warning about. Libby cuts him off. When she says she's going ahead with the fight he tells her he's proud of her and he'll stop harassing her. But not Drew, who has to make sure Libby doesn't run herself into the ground. Maggie was meant to take the kids as Evan's got a ton of marking. Drew and Libby arrive and Maggie leaves with them – Evan's still mad but he's always like that on school holidays. Karl asks Darcy about Tess. She won't talk to him. Karl asks if he cares enough to go after her – Darcy thinks he does. Darcy asks about what Karl did when he cheated on Susan: Karl warns he's on dangerous ground but says he grieved and behaved like an idiot while Susan did everything and forgave him. He would never have given up – without her he was half a person and he would never give up easily. Darcy asks to borrow his car. The assembled gang of Maggie, Susan, Libby and Drew talk about what they need to do. Drew says it's obvious the Chronicle would do things to put Libby off taking the case forward. They need to find someone on the staff who'll talk to them. Darcy stands watching Tess brush up leaves, staring very scarily in a silent way like Gus Cleary (2004). He asks for two minutes of her time. Then he promises to he'll go. Maggie returns. They argue over her being too late to answer a call from her supervisor. Evan isn't best pleased when he finds Emily has drawn on the back on one of the exam papers he has to mark. What tragedy! Maggie is on Emily's side and Evan lets out a remark about her not being around a lot lately, which doesn't go down well. Evan dashes off to talk to his daughter. Karl sits with his wife. They've been flat out at the surgery because Darcy's been away: he wants to try again with Tess. As he checks through his messages he finds one for Darcy from Marcus Teague, a wheeler dealer for Total Cover Health, a big cooperation. Karl wonders what he's doing calling Darcy. Susan is just as lost for an explanation. Darcy really knew he loved Tess when he realised how much he'd hurt her and he loves her more than anyone he's loved before. She starts to walk away, not wanting to hear it. He says he's asking her to marry him. He understands that it'll be a shock and she might need more time…Tess demands to know if he thinks a marriage proposal is going to fix everything. He presents a ring which she takes from him and looks at.